Barbara Ann Durham Simmons of Green County, Kentucky, daughter of the late Richard Durham and Flossie Patrum Durham, was born on Saturday, August 12, 1933 in Green County and departed this life on Tuesday, August 7, 2018 in Campbellsville. She was 84 years, 11 months, and 26 days of age. 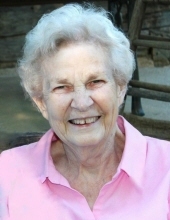 She was a Medical Assistant and a member of the Green County Historical Society. She was preceded in death by her husband, Dr. Robert Proctor Simmons on August 20, 2014 having united in marriage on May 29, 1953. Survivors include three sons and two daughters-in-law: Dr. Robert Louis and Denise Simmons of Campbellsville, Dr. Alan Joseph and Christine Simmons of Chicago, and Morris Simmons of Greensburg; five grandchildren: Austin Hays and her husband, Mark of Glasgow, Adam Simmons, Jonathan Simmons, Landon Simmons all of Campbellsville, and Joey Simmons and his wife, Sarah of Tennessee; two great-grandchildren: Carter Simmons, and Gavin Hays; two sisters and a brother-in-law: Margaret and Walter Harold Perkins of Campbellsville, and Marsha Alcorn of Tennessee; a brother: Henry Wayne Durham of Campbellsville; special friends: Della Loyall, Marbellis Erhardt, and Shirley Phillips; and a host of other relatives and friends. Mrs. Simmons was also preceded in death by two sisters and a brother: Jean Denney, Billie Chapman, and Ernest Durham. The funeral services for Barbara Ann Durham Simmons will be conducted at 9:00 A.M., Central Time, Sunday, August 12, 2018 at the Cowherd and Parrott Funeral Home with cremation to follow. Warren Wolfe officiating. Visitation is requested form 5 P.M. until 8 P.M., Central Time, Saturday at the Cowherd and Parrott Funeral Home and after 7 A.M., Sunday until time of the funeral service. To plant a tree in memory of Barbara Ann Durham Simmons, please visit our Tribute Store. "Email Address" would like to share the life celebration of Barbara Ann Durham Simmons. Click on the "link" to go to share a favorite memory or leave a condolence message for the family.